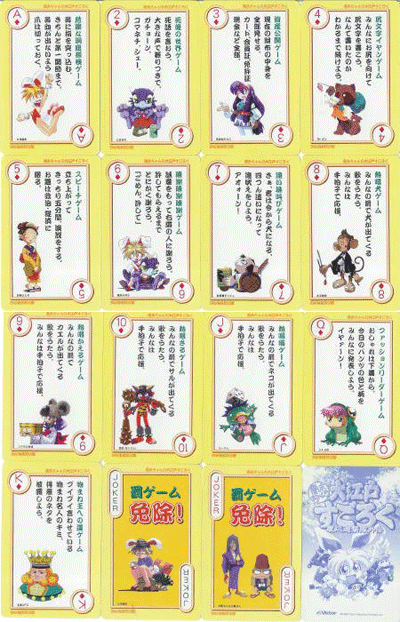 While only a limited amount of books and merchandise were released in relation to the Keio Yuugekitai games, this page attempts to keep a complete list of all items related to the games. This big colourful artbook is full of interesting information about the Keio Yuugekitai Katsugekihen game, and has an insane amount of pretty artwork. It also comes with a demo for the Japanese Keio Yuugekitai Katsugekihen game. Published by Game Fan Books around the release of the Keio Yuugekitai Katsugekihen game for Sega Saturn, more precisely the 10th of September, 1996. The book is 96 pages. It provides an illustrated walkthrough of the game, supposedly with some strategies on how to beat certain enemies and stuff like that. You also get some general character information, and a nifty section at the back with reference to the developers of the game, a few sketches of game concepts, and what appears to be an interview of the developers. Feel free to check out our scans of the Keio Yuugekitai Katsugekihen Game Guide. At the time of Keio Yuugekitai Katsugekihen’s release in Japan, two novels were released presumably to further the story. They are actual written novels, not “graphic novels” (or in non-wankerese, comics) of 223 and 255 pages respectively. The first was published on the 9th of March, 1996, and the second published on the 27th of July, 1996. From the pictures it could be seen they quite closely mirror the story of the Keio Yuugekitai games, with Rami, Pochi, Himiko, and Dr. Pon. I believe the first is based very loosely on the story of Keio Yuugekitai for the Mega CD, with an added adult bunny girl character I don’t recognise, and the second is more closely based on the story of Keio Yuugekitai Katsugekihen for the Saturn. The books are softcover, tightly bound little things each with a fold-out image on the inside of the cover. The books start with a short character summary using graphics, and there are a few (~10) pages throughout the novel with manga-style illustrations in a short comic form, however the books are mostly text. We have some scans of notable parts of the Keio Yuugekitai Katsugekihen novels. 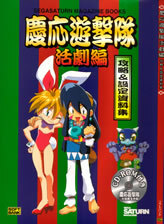 There are three known Keio Yuugekitai Doujinshi in existence. There may be more. I don’t know much about these, I just saw an auction for them on Yahoo! Japan. A full image of the playing cards is available, though it’s in fairly low resolution. I would assume all the suits are involved, not just diamond.